After weeks of closed-door discussions with lawyers, President Trump and his team issued a replacement executive order temporarily banning immigrants from six Muslim-majority countries from coming to the United States. The new executive order is more carefully written, with an eye toward being defensible in court, but it still an unarguably cruel and unnecessary act that will endanger thousands of lives. 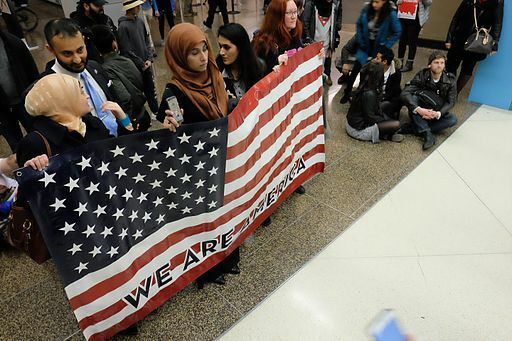 A few weeks ago, the Ninth Circuit Court of Appeals struck down President Trump’s first executive order banning visa holders and immigrants from seven majority-Muslim countries from entering the United States. The president was undeterred, calling the decision “so political” and vowing to continue his efforts to ban “bad guys” from the country. The new temporary ban does not affect holders of visas or green cards (technically known as “lawful permanent residents”), which analysts have seen as a measure designed to help it stand up in court. The ACLU has already begun adjusting its court filings so they can be applied to version 2 of the executive order, which they have said they plan to challenge. The new executive order does not apply to Iraq, one of the countries most under the thumb of ISIL, the group claiming responsibility for terrorist attacks worldwide. However, it puts a 120-day hold on refugees from Sudan, Syria, Iran, Libya, Somalia, and Yemen. The United States already has an exhaustive, 20-step vetting process that takes two years to complete. It includes several background checks, several interviews with the UN, and three fingerprint screenings, in addition to the exhaustive interviews and testing in the U.S. It has kept thousands of people, including contractors who worked for the American military abroad and are at risk because of it, from entering the country. The likelihood of an American being killed by a Muslim terrorist is miniscule—you’re more likely to drown in your bathtub, be struck by lightning, or be slain by a white, male American citizen with a legally purchased weapon. The security rationale for this order is virtually nonexistent, and that’s what might give the ACLU hope. By proving that the intent of the order is to prevent Muslims from entering the United States, and not, as Secretary of State Rex Tillerson said, to “protect the nation from foreign terrorist entry,” the ACLU could help the courts find the new executive order unconstitutional. The pathetically small danger posted by immigrants is a help here: The government would have a hard time proving that the country is demonstrably safer without refugees, or that President Trump and his advisors could even think that would be the case. Civil rights advocates said Monday that the new ban’s sudden exclusion of Iraq, as well as the omission of other countries with active terrorist groups—such as Colombia, Venezuela, Pakistan and the Philippines—underscored the ban’s arbitrariness as a national security measure. In fact, many have argued that the order, which will take effect on March 16th, makes Americans less safe because it disincentivizes foreign governments from cooperating with the United States. Failure to coordinate intelligence, strategy, and humanitarian aid will significantly lessen the United States’ standing as a global power and leave it vulnerable to strategic attacks. There are many reasons for nonprofits to reject this executive order. For one thing, many organizations that resettle and assist refugees rely on federal support for their programs, which could diminish or even evaporate as federal funding for immigrant assimilation erodes. For another, organizations with international branches or expat staff may find themselves with uncooperative governments, stung by new security restrictions and the exclusionary attitude of America’s fearful president. Most importantly, the policy is just plain wrong. The problem with the higher burden of proof is it functions as a de facto permanent ban from Syria, whose major cities have been bombed into obliteration. Syrian refugees are lucky to escape with their lives; expecting them to have bank statements, mortgage paperwork, police records, or any paper of value is absurd. In addition, the 120-day suspension is unconscionable: on average, more than 40 Syrians are dying every day. That means that by the time the temporary ban is lifted, more than five thousand people will have died from that conflict alone. In October, Nadia Murad became the first Iraqi to receive the Nobel Peace Prize for her campaign to end the use of sexual violence as a weapon of war. Why has there been so little note of it? The massacre of gender has deep roots.